Our goal at the Boys & Girls Club of Bay City is to help prepare our members to be LEADERS of TOMORROW. By doing so, we encourage positive attitudes, education, good sportsmanship and friendship. Our aim is to empower boys & girls with the skills needed to face all types of challenges that they may encounter. 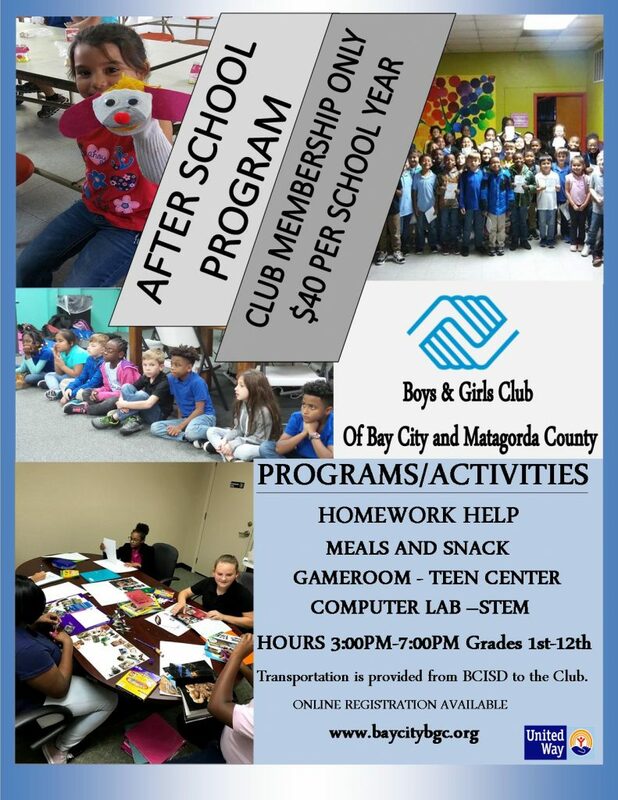 The Boys & Girls Club of Bay City and Matagorda County bases its programs on membership, community involvement and its recognized role as an advocate for youth. The Club is aware of the influences of the total environment and so provides youth with the relevant, every day, varied and diversified individual and group services—based on proven principles of youth development—which will achieve the health, social, educational, vocational, character and leadership development of our membership. To become a member, a parent or guardian must fill out forms COMPLETELY and return to Club office during administrative hours of 9:00 am to 3:00 pm Monday- Friday. All members will receive a membership card valid for the school year once payment has been received and all forms are returned. MUST bring in online payment receipt with completed paper work.